I've been trying different methods of getting good 4x5 scans for ages with results that were never fully satisfactory. I finally decided to pull the trigger on a big piece of Anti-Newton Ring glass for sandwiching my negatives and I'm pleased to find that this will very likely work perfectly, at least for my black and white negatives. I haven't gotten color negs to show up without Newton Rings yet, and that may end up being remedied by yet another piece of ANR glass, but then I'll have to figure out precise heights for shims so I can get proper focus from our scanner. I have a bit of color to scan so I wish I had this sorted now (I'm trying hard to get this Kodak 160 scanned so I can review it for them, shot on the Legotron and a normal field camera) but for now I can at least knock out black and white in a way that pleases me. IF YOU KNOW A GREAT WAY OF SCANNING 4x5 COLOR NEGATIVES ON A FLATBED, PLEASE TELL ME. Enough nerdery. 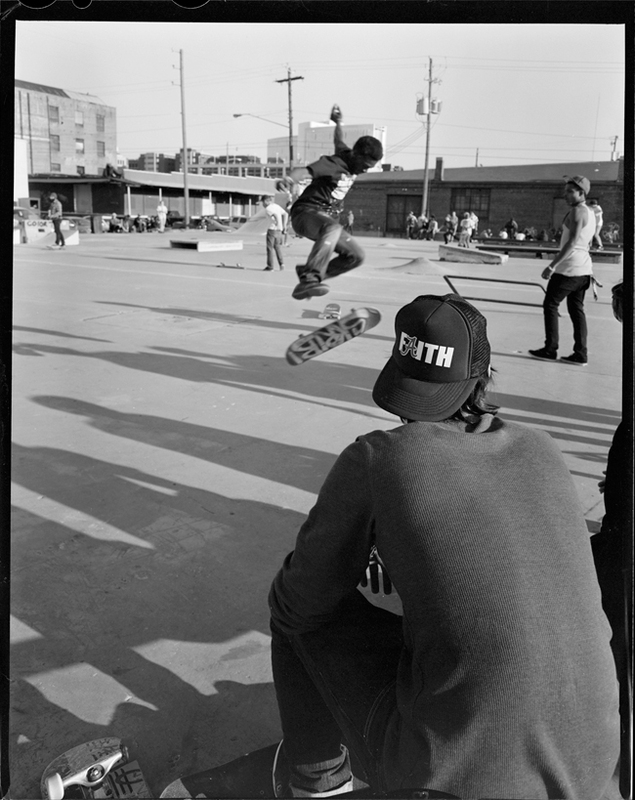 This shot was from a Halloween skate comp at the now-defunct Shoe Factory spot here in Birmingham. The skate was actually to raise money to move the ramps to a new location (which is important, because the ramps actually got thrown away before being salvaged for the Shoe Factory spot). It was put on by Faith Skate Supply, who is also currently pimping out a very worthy cause—A.Skate. In short, A.Skate has an opportunity to build an Autism-friendly, handicap accessible skate park, but they need your votes to help win the Pepsi contest. Hit that link to see the (EASY!) ways to vote! And seriously, if you've got color 4x5 scanning tips, I'm all ears.